Discussion in 'Current Events' started by MrTLegal, Feb 13, 2019. The judge ruled that Manafort lied, intentionally, in 3 of the 5 instances cited by Mueller. The most significant of which is about his meeting at the Havana Club (a Kushner owned building) with a Russian Intelligence Officer, Konstantin Kilminik, that happened while Manafort was still Trump's campaign chairman. To be clear, this is a federal judge ruling that Trump's campaign chairman lied to investigators about his coordination with a Russian oligarch. And he lied because, according to Mueller, he believed that telling the full truth would be highly damaging to Donald trump personally. This ruling means that Mueller is no longer contractually obligated to uphold his end of the plea deal (like requesting a reduced sentence for Manafort), but it does not mean that Manafort can withdraw his guilty pleas. Does this mean that the only way Manafort can save himself is to finally tell the truth about Trump? He will stonewall it and sit patiently in a cell while waiting for Trump to pardon him next year. The article states the Court ruled he did not lie about his interactions with the White House. One more smoking gun that the Trump campaign colluded with Russian intelligence. LOL. I hope you have a lot of these awards. There's going to be a lot of 'beat down' to the White House crowd when Mueller releases his findings. 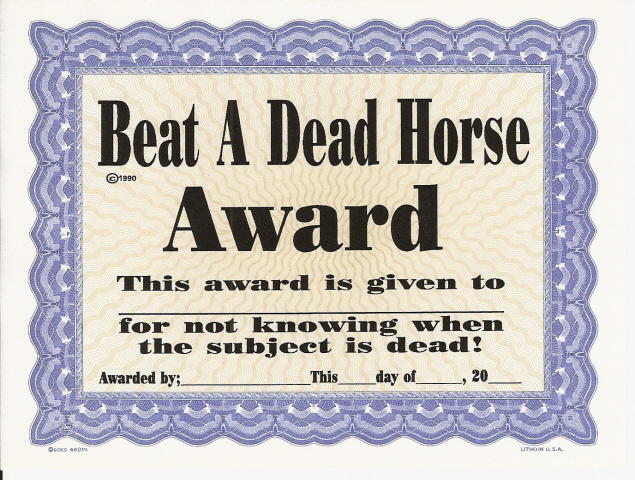 We will discuss Mueller's report when it comes out, meanwhile it does not change the fact that the Manafort story is an absolutely classic case of beating a dead horse if there's ever been one. headhawg7, AmericanNationalist, Ddyad and 2 others like this. Buzzz... not true... she said the OSC didn't prove he lied... a distinction you missed. The fact is that the Kilimick lies were made during his time in the Trump campaign. Also, the charge of lying to the "admin" was for actions made well after the election, so that one likely had no connection with the collusion anyway, except in a cover-up capacity..
Yeah...it can't be proven...therefore the presumption of innocence remains. He's innocent of that accusation. Kilimick was an employee, and had been an employee of Manafort's firm since 2005. It should also be noted that the Court found he didn't lie in regards to Kimick's role in any conspircy to obstruct justice. The bottomline, this is a nothing burger for the President...bad news for Manafort. Who in the world is indicating this is anything for Trump personally? However, it's pretty obvious in addition to lying during his "cooperation" with the OSC, Manafort was likely not fully forthcoming on how Trump was involved in the 2016 campaign collusion, which is good news for Trump and a life sentence for Manafort. With that said, the Court ruled he didn't lie in regards to his communications with the Trump Admin. A federal judge ruling that Manafort's plea deal is now null and void because she found, by a preponderance of the evidence, that he violated the plea deal and lied to investigators about (among other things) his coordination with a Russian oligarch is not beating a dead horse. But he did lie about his coordination with a Russian oligarch while he was still the Campaign Manager for Trump's campaign. You dude made it all up to desperately make it appear that you are not beating a dead horse. Lol, major FAIL. Ddyad, mngam, Badaboom and 1 other person like this. I'll personally be laughing all the way until the impeachment hearings start..... which they would over that, since there is no realistic reason you can post why Manafort would be pardon-worthy except as political payback for lying for Trump..
Is Kiliminik almost universally considered a direct link (if not directly) a Russian oligarch/intelligence officer? Yes. Is a discussion of how to split the Crimean region permanently into Russia away from Ukraine and to ease sanctions against Russia a "coordination?" Yes. Did Manafort lie about his coordination with a Russian oligarch while employed as Trump's Campaign Manager? Yes. Push my senator to vote yes on impeachment. Brilliant. Then you can have both Manafort and Trump pardoned by President Mike Pence. You guys are priceless. Russian Oligarch? The guy was a former employee of Manafort's firm. He did lie about the conversation, but not about any conspiracy to obstruct justice according to the Court. - glad we agree then that your categorical claim in the OP that Kiliminik is a Russian intelligence officer is absolutely bogus, just like i indicated in my previous post. AmericanNationalist and mngam like this.